So, it happened - my first official brain fart of 2018. Despite all my productive habits and a fresh wave of blogging inspiration, January finally got me and my girl boss attitude well and good with a case of creative block this week. Knowing what to write about in my first style post for some time has been quite a challenge and lemme tell you, countless list-making, blog reading and Instagram scrolling didn't seem to help. It wasn't until I had a little Monday moan to my beloved work wife, Meg that the idea came up to write around everyone's favourite winter staple and comfort item: the cosy jumper. 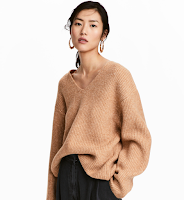 Whilst I think part of a jumper's appeal is the fact that there are so many kinds to suit pretty much any occasion, I'm sure we've all got a little soft spot for a particular knitwear piece with a certain neck line, colour or style. In my case, it's anything from a shade of cream through to beige, preferably with a bit of texture and toasty warm. Most importantly though, it has to strike a balance between looking both timeless and interesting if it's going to withstand my regular and ruthless wardrobe clear-outs. Something like the well-loved Mango number I'm wearing here is a perfect example of a classic knit that also has a touch of something different with it's random flecks of burgundy and navy threads running throughout. Its these little details and quirks that take a plainer piece of clothing and elevate it into what I consider a favourite. Other ways I like to add a little summin' summin' are with some statement sleeves, cool fabric blends or a flattering neck line. Ultimately though, it's all about finding a style of jumper that you know looks good, feels comfortable and transitions well with what's in your wardrobe. You find that - well that's the moment when a jumper goes from good to the stuff blog posts are made of my friends! So where do you find the perfect cosy jumper? If you're lucky, you might find it for free in your boyfriend's collection and lets face it, those ones are always the snuggliest. Otherwise, I love to hunt out any new knitwear additions somewhere like Zara, H&M, Mango, Weekday or & Other Stories - basically, the European brands do it best.